Would-Be Hijacker Killed In Bangladesh The man allegedly pulled out a gun and tried to hijack the plane shortly after takeoff. After the aircraft made an emergency landing, military commandos shot and killed him. 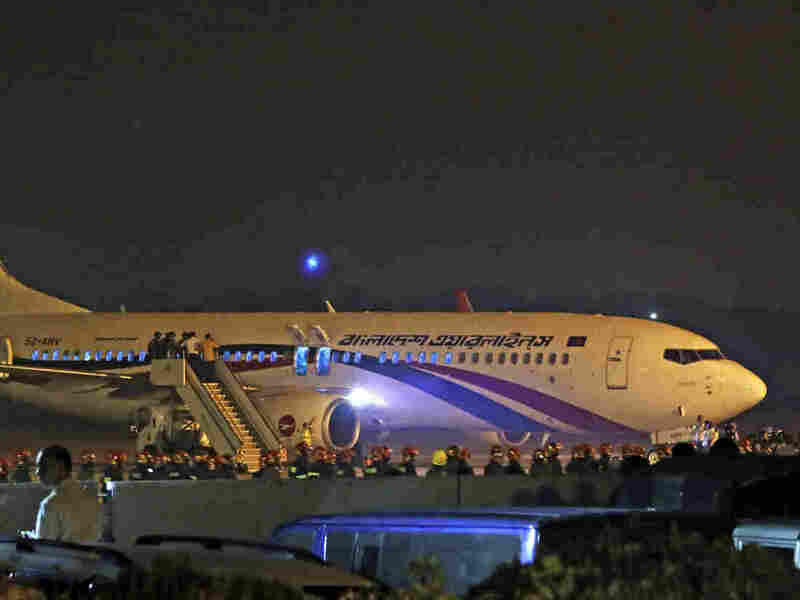 Bangladesh's state-run Biman Bangladesh Airlines flight is seen after it made an emergency landing at the airport in Chittagong, Bangladesh on Sunday. Military commandos killed a man who attempted to hijack a plane in Bangladesh on Sunday. The flight on state-run Biman Bangladesh Airlines left Dhaka in the afternoon. Shortly thereafter, the man, in his mid-20s, stood up and tried to enter the cockpit, aviation officials said, according to Reuters. When a member of the crew tried to stop him, he brandished a pistol and threatened to blow up the plane. One passenger told Agence France-Press that soon after the plane took off, the man fired his weapon twice. Pilots made an emergency landing at Chittagong's Shah Amanat International Airport. Upon landing, all of the approximately 140 passengers and most of the crew were able to exit the Boeing 737-800, but the man kept one crew member as a hostage, according to Reuters. Once on the ground, an aviation security official said he kept the man busy by talking on the phone while military forces prepared to raid the plane, AFP reported. The man said he wanted to speak to Prime Minister Sheikh Hasina. "It seems he is psychologically deranged," the country's civil aviation chief Nayeem Hasan said. Reuters quoted a police official who said the suspect was carrying a "toy pistol." However, an army official told reporters the situation escalated when the man fired at army commandos after they entered the plane and tried to force him to surrender. "He rejected, and tried to retaliate, which led to the exchange of fire inside the plane," said Major General Motiur Rahman of the Bangladesh Army, according to local media. The man, described by Rahman as a "terrorist," was arrested and transported to the hospital, but died before he arrived, The Associated Press reported.